First of all, we’re excited to announce that the TRIFORCE® team will be at the International Builders Show (IBS). Organized by the National Association of Home Builders (NAHB), the IBS will be held in Las Vegas from February 19 to February 21, 2019. Welcoming over 80,000 attendees as part of the Design & Construction Week®, the IBS is a major national event for builders, architects, designers, and other professionals of the construction industry. TRIFORCE® will be exhibiting at booth C2449. You can find more information about the IBS on their website. Then, just a month later, we will be at JLC Live New England in Providence, from March 28 to 30. This residential construction show attracts thousands of builders, remodelers, and crews from across New England who are looking up to perfect their skills and build their businesses by networking with exhibiting companies, getting up-to-date practical information in conference sessions and attending live building clinics. Our team will be waiting for you at booth #1014. You can learn more here. These two events are perfect if you’re looking to find out more about our open joist. You will get to meet our team, see the actual product, and ask any question you may have. We’ll be happy to show you how simple it is to use TRIFORCE® in your projects. We will demonstrate how easy it is to benefit from its fire-resistance when installed according to the detail below. 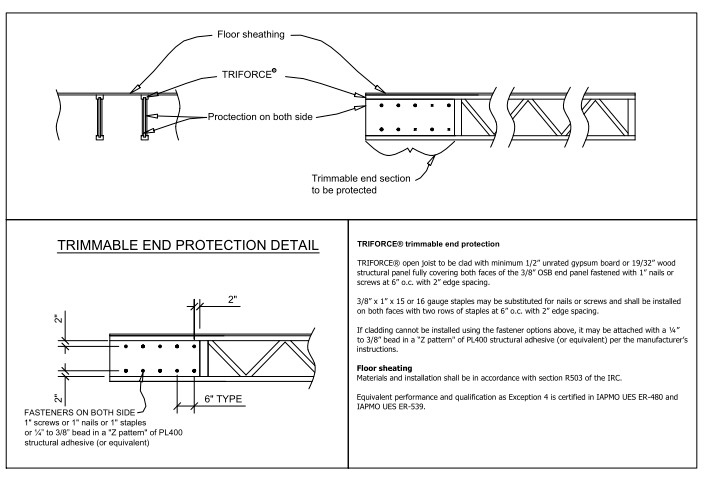 You will appreciate that TRIFORCE® open joist has been evaluated for equivalent fire-resistant construction to 2-inch-by-10-inch nominal dimension lumber in accordance with Exception 4 of Section R302.13 of the 2015 / 2018 International Residential Code®. Don’t forget to register for the IBS and JLC Live! We hope to see you there! In the meantime, we invite you to stay tuned for more great news. And again, we wish you a wonderful 2019! Can depths over 16″ be achieved? Thank you for your interest in TRIFORCE joist. Yes, we can accomodate other depths. We sent you more details in a private message. We have successfully used the TRIFORCE open joist and like everything about them – total win win for everyone. One thing we find in the residential sector is that most architects/designers are specifying 11 7/8″ I joist. I would be great if Barrette Structural could create a TRIFORCE open joist that competed with I joist span capabilities. If they did, I would we would switch over and never look back! Within typical loading conditions, single-span TRIFORCE® joists in the 11-7/8” depth have greater span capabilities than wood I-Joists of this depth. For typical spacings of 16”, 19.2” and 24” o.c., when compared to single-span capabilities of series PRI-20 through PRI-50 I-Joists (as published by APA), TRIFORCE® joists exceed span capabilities of wood I-Joists by a minimum of 12.2% and as much as 23.5%. Comparisons were made in residential loading conditions. In terms of floor performance, it should be noted that single-span joists are more effective in controlling floor vibration than multiple-span joists.